We just learned about the Invertebral Disc that gives padding on the spine. Another ligament that helps cushion the spine and hold it in place is the Posterior longitudinal ligament. This connective tissue goes up and down in the middle of the spine. We just learned about the Mexico State of Neuvo León. 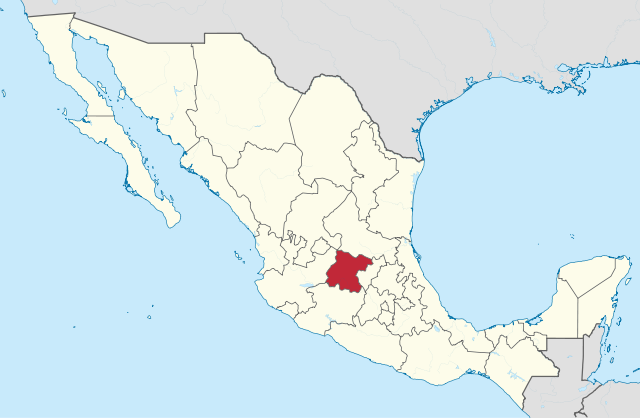 Another Mexico State is Michoacán. 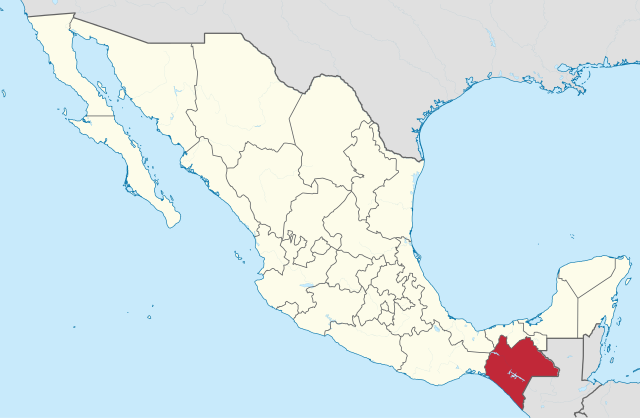 This state is on the south west part of Mexico, on the Pacific Ocean. It's name means place of the fishermen. The coat of arms has a fish at the top for the place of fishermen. On the left is a person on horseback for the famous General José María Morelos y Pavón. On the right are three crowns for the history of the Purépecha empire. The bottom left and right are for the workers and people of the state. The Sierra madre del sur mountains go through the state, along the ocean front. We just learned about the Ladder of Divine Ascent with 30 steps to follow to be a good Christian. Another famous Monks was Theodore the Studite. He was a monk in the city of Constantinople, which was the city in charge of all of the churches at the time. Theodore was the first monk to say that there should be no slavery. He also fought against the church using paintings called "icons", that were of Jesus or the apostles or other famous followers. Instead of these icons he said they should use symbols like the cross. There was a big argument with other church people, and it had a big name called the iconoclasm. We just learned about the Arc de Triomphe by Jean-Pierre Cortot in Paris, France. Another neoclassical sculpture is the statue of Copernicus by Bertel Thorwaldsen. Copernicus was a Polish astronomer, famous for telling everyone that the sun was the middle of our galaxy, because people used to think the earth was at the middle. Bertel Thorwaldsen was a famous sculptor, and was given the job to make this famous statue honoring Copernicus. During World War II, the nazi army took the statue down and had plans to melt it, but they lost the war before they melted it down so the Polish people put the statue back up. We just learned a few ways to say hello and goodbye in Greek, like Γειά σου (Geiá sou), Χαίρετε (Chairete), and Αντίο (Antío). Sometimes you might want to say good morning, good afternoon, or good night. We just learned about the Aftershock that happens after the biggest part of the earthquake. We've learned about the Dip Slip fault before. Another fault type is a Thrust Fault. This is a lot like the dip-slip, but the slip goes in the opposite direction. Sometimes they even call it a reverse thrust fault. We just learned about the Mission Golden-eyed Tree Frog or Amazon Milk Frog. Another type of frog is Wallace's Flying Frog. It is only about 100 milimeters long, and has long toes with webbing in between. 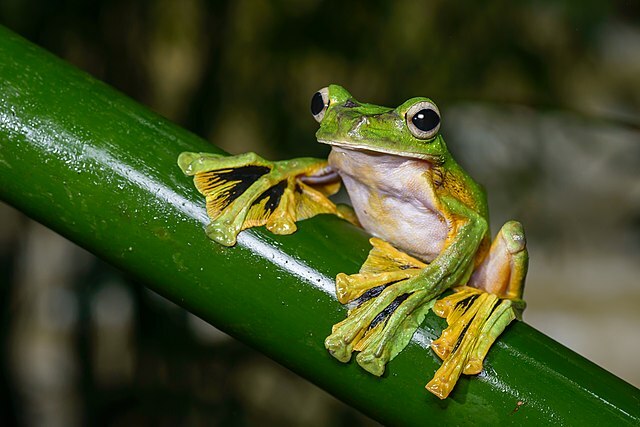 With these big feet that are almost like wings, this frog can float like a parachute down from trees, or even jump and glide from tree to tree. These are very bright and colorful frogs, with a shiny green back, a yellow or white belly, and yellow coloring on it's toes. We just learned about the connective tissue the Supraspinous Ligament that goes over the back of your spine. Another piece of connective tissue is the Intervertebral Disc, or the Intervertebral Fibrocartilage. This is the piece of cartilage that is in between each of your vertebrae in your spine. These discs protect each of your vertebrae from bumping against each other, and also helps hold them together. They also work like shock absorbers so when you are jumping up and down, all the vertebrae in your spine have soft cushions between them. We just learned about the Mexico State of Chiapas. 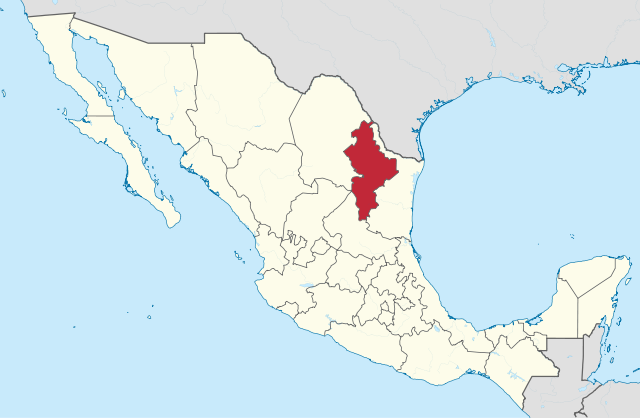 Another Mexico state is Nuevo León, which means New Lion, and is named after the state in Spain called León. This state is north part of Mexico, and has one small 9 mile stretch where it connects to the US at the state of Texas. The coat of arms for Nuevo León shows the Cerro de la Silla mountains, next a lion for the state's name. Below that is the temple of San Francisco which was part of Nuevo León but is now in Texas. Next to the temple are chimneys showing the workers of Mexico. In the borders are old weapons from the warriors from long ago, and chains for the group of all the people working together. On the bottom is a ribbon that says "Semper Ascendens" which means "Always Ascending". La Huasteca is a place where a lot of people like to go rock climbing. Cerro de la Silla which means hill of the chair is a mountain area where a lot of people like to go hiking. The state has a large farm of wind turbines that can bring electricity to over 630,000 homes. We just learned about the Lavra caves for monks. Another part of the life of monks was a writing called the Ladder of Divine Ascent. This was a book that gave people some rules and ideas about things they should do to be better servants of God. There were 30 steps to the ladder, and they covered things like obeying God, asking for forgiveness, not doing bad things, not thinking you are better than other people, and inner peace. Many monks read these words and tried to follow them to be better servants. We just learned about the Rococo or Rocaille sculpture Sèvres pot-pourri vase in the shape of a ship by Duplessis in Paris 1757. In art history, after Rococo came a type of art called NeoClassicism, which tried to make simple and pleasing all around. One of the most famous Neoclassical sculptures is the Arc de Triomphe in Paris, France in 1806 by sculptor Jean-Pierre Cortot. This arch was built to honor the people who fought and died for France. The names of hundreds of soldiers are engraved all around the arch. There are many sculptures all around the arch, like the four very detailed groups of sculptures on the pillars. The sides have six relief sculptures, the arches have detailed sculptures, and even the ceiling of the arch has 21 sculpted roses. The arch is in the middle of a part of the city with many roads leading to it. We've now learned a whole year of ASL! Let's try another language now, how about Greek? Greek is very different from the other written languages we know, because it's letters are very different. Some of them are like English, like A and B, but others are very different, like Θ or Ξ! Let's try to learn some words, and along the way we'll try to learn how to pronounce the letters too. First let's learn how to say hello and goodbye. There are a few ways to say Hello. This is like saying Hi to your friends. It means "To your health", so you can say this for goodbye also. This is like saying hello to a grownup. It means "Be happy", so you can say this for goodbye also. We just learned about the Foreshock and Mainshock of an earthquake. After the Mainshock comes the Aftershock. When the earthquake passes it's strongest part of the mainshock, any of the other quakes or ground shaking is part of the aftershock. Separating the earthquake into the three parts (Foreshock, Mainshock and Aftershock) helps earthquake scientists study each part of the quake, and learn about why the earth acts the way it does. We just learned about the Bornean Eared Frog. Another type of frog is the Mission Golden-Eyed Tree Frog, also called the Amazon milk frog or blue milk frog. This frog lives in the Amazon rainforest in South America. They are about 4 inches long, with light grey and black bands on them. The "milk" in their name comes from the milky liquid that comes off of their bodies when they get scared. This gooey milk can help them slip away from an animal that is trying to eat them! We just learned about the Xiphoid Process in the chest. Another two important pieces of connective tissue are the Supraspinous ligament and Nuchal ligament. These ligaments are on the outside of the back of your spine, covering the bony part of the back of your spine. The nuchal ligament goes from your head to the middle of your back, and the supraspinous ligament goes from your back all the way to the bottom of your spine. We just learned about the Mexico state of Guanajuato. Another Mexico state is Chiapas. 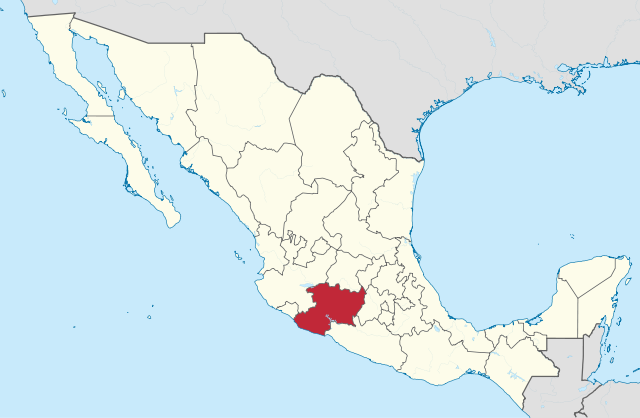 This state borders the Pacific Ocean, and the country of Guatemala. The coat of arms of Chiapas is a shield with a red background, for the dangers of the past. There are two cliffs, with the Grijalva river in the middle, for the justice of the state. On the left cliff there is a lion with a castle, for heroism and strength. On the right cliff is a lion and a palm tree, for victory and protection. There are ancient ruins from over 1,000 years ago in a place called Palenque. Chiapas has some of the oldest fossils found in North America, with one building uncovered from 700 BC, over 2,700 years ago! We just learned about the Cenobitic Monks that lived in monastaries. Another part of the monk's lives was a Lavra. Some of the monks that were not exactly hermit or cenobitic monks would live in bunch of caves near each other, with a church in the middle of all the caves. This bunch of caves was called a lavra. We just learned about the Rococo sculpture of Three Derby Figures made by the Royal Crown Derby porcelain shop. Another Rococo art sculputre is the Sèvres pot-pourri vase in the shape of a ship made by Jean-Claude Chambellan Duplessis in Paris, in 1757. Pot pourri is a bunch of nice smelling leaves and plants that are put into a small vase to make a nice smell. The sculptor Jean-Claude Duplessis worked for the Sèvres porcelain maker in Paris, and he made these pot-pourri holders in the shape of sailing ships for people to buy. Many rich and famous people collected these pot-pourri holders made here. In France the Rococo style was a little different, and was known as Rocaille. We just learned how to say some fruits in ASL! carrot - Hold your left hand out flat in the B hand shape, and your right hand in a fist, with your thumb sticking out. Wave your thumb down a few times on the front of your flat B hand, almost like you are peeling a carrot. corn - Close all your fingers except your index finger. With that finger pointed out, hold the side of your finger up on your upper lip and twist your finger a few times. You can also use two hands in front of you, like you are holding a corn on the cob and twist them a few times. pea - Put your left hand in front of you with just your index finger pointing to the right. Using the index finger of your right hand, tap along your left finger, almost like you are counting peas in a pod. We just learned about the Foreshock that happens before the biggest part of the earthquake. The biggest part of the earthquake is called the Mainshock. This is when the earthquake is at it's strongest force. We just learned about the Lemur Tree Frog. Another type of frog is the Bornean Eared Frog. This type of frog has bones in it's skull behind the eyes, so it looks like it has big pointy ears, and that's where it gets its name. They mostly live in southeast asia, in ponds or near forests. They can come in a few different colors like brown, grey or yellow, and they have thin black stripes on their legs and thighs. We just learned about the Costal Cartilage. Another piece of connective tissue in the body is the Xiphoid Process. This is a small piece of cartilage on the bottom of the sternum, in the middle of the chest. The xiphoid process connects the chest to many other parts of the body, like the muscles used for breathing or moving your stomach area around. We just learned about the Mexico State of Puebla. Another Mexican state is Guanajuato. This state is in the middle of Mexico, and does not border either ocean. The flag of Guanajuato has the coat of arms on it, which shows a person in the middle holding a cross, to show the battles that the Catholic church had helped with for Mexico. Mammillaria duwei is a species of flowering cactus, sometimes called the biznaguita. The only place it grows in the whole world is in the state of Guanajuato. These cacti are endangered and there are maybe only around 500 left in the wild. There is a museum called the "Museo de las Momias" in Mexico, that has Mummies on display! There are ancient ruins from people who lived in Mexico long ago, in the town of Plazauelas. There is an old convent called San Agustín de Yuriria, built in 1550.